pojemność: e 400 ml | 13,52 fl.oz. Protective Shampoo of a new generation, dedicated to any type of hair exposed to high temperature and subjected to hot styling. The preparation is based on an innovative formula which combines nourishing properties of Monoi oil and protective qualities of the Thermo Protection System. Delicately cleanses hair and thanks to Aqua Moisture Complex hydrates and smoothes them. Advanced formula protects hair from harmfull effects of high temperature and helps keep hair in a good condition. Apply a small amount of Shampoo on wet hair. Massage gently until foam appears, then rinse with warm water. The product is intended for every-day use. Monoi oil - unique traditional oil deriving from a region on Tahiti. It combines care properties with exceptional scent of exotic flowers. It is obtained as a result of maceration of flowers of Tahitian Gardenia (Gardenia Tahitensis) on the basis of cold-pressed coconut oil. It possesses high resemblance to hair fibre. It deeply regenerates dry hair, becoming incorporated into hair structure, smoothing it and preventing mechanical damages; it protects hair from UV radiation, detergents, salty and chlorinated water. 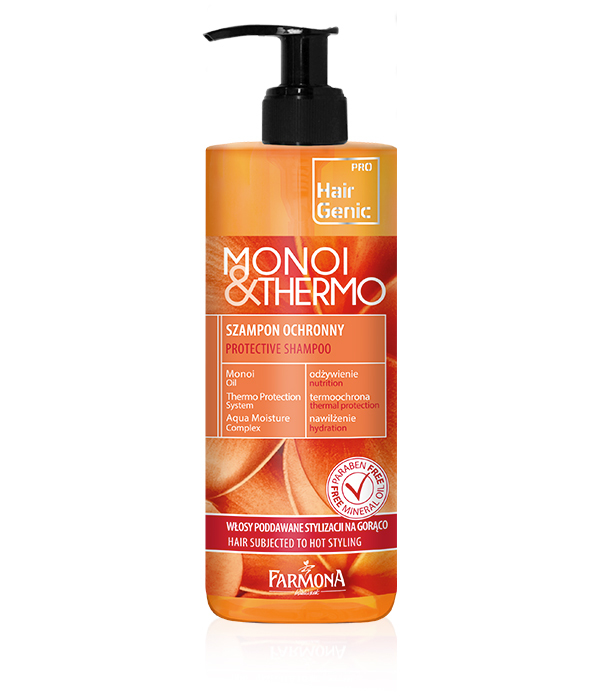 Thermo Protection System - multi-functional silicone conditioner which, apart from excellent conditioning properties, ensures advanced protection of hair from high temperature and cares for dyed hair. Aqua Moisture Complex - advanced complex composed of silk proteins, bio-functional peptides and amino-acids from hydrolyzate from carob tree. Thanks to its similarities to hair, it increases retaining of moisture on hair surface and thereby increases hair susceptibility for styling, prevents static and gives the hair healthy appearance, softness and silky lustre. Aqua (Water), Sodium Laureth Sulfate, Cocamidopropyl Betaine, Cocamide DEA, Parfum (Fragrance), Coco Glucoside, Glyceryl Oleate, Silicone Quaternium-22, Polyglyceryl-3 Caprate, Dipropylene Glycol, Hydrolyzed Silk, Cocos Nucifera Oil, Gardenia Tahitensis Flower Extract, Glycerin, Hydrolyzed Ceratonia Siliqua (Carob) Seed Extract, Zea Mays Starch, Polyquaternium-7, Guar Hydroxypropyltrimonium Chloride, Potassium Sorbate, Sodium benzoate, Cetrimonium Chloride, Polyquaternium-10, Lactic Acid, Sodium Chloride, Disodium EDTA, Limonene, CI 19140, CI 16255.